Want to edit and convert video to Blu-ray? With Aura Video Editor, you can easily add MP4, FLV, WMV, 3GP, MPG, etc. with photos, music and subtitles and convert to Blu-ray DVD disc. Follow the simple tutorial to convert video to Blu-ray. 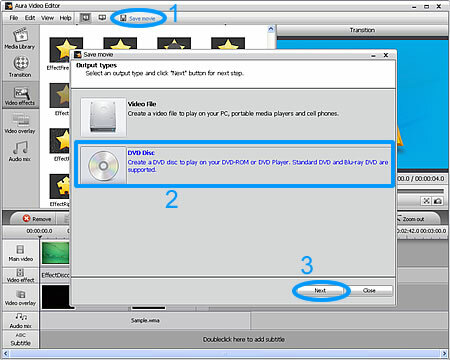 Aura Video Editor, the Video to Blu-ray Converter, supports 40+ input video formats and commen image and music formats. See all supported formats. It provides numerous transitions and effects, and enables you to trim and crop your video, add watermarks and subtitles, overlay videos, etc. Besides burning and converting video to Blu-ray DVD, you can also convert video to standard DVD disc and other video formats like MP4, WMV, FLV, 3GP, MKV, etc. for iPod, iPhone, iPad, PSP and more. 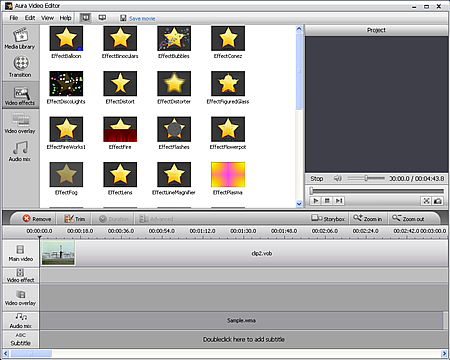 Start Aura Video Editor, click Import button to add video, image and audio files. Then drag and drop them to the relative place of the editing area. Edit the name of the videos. 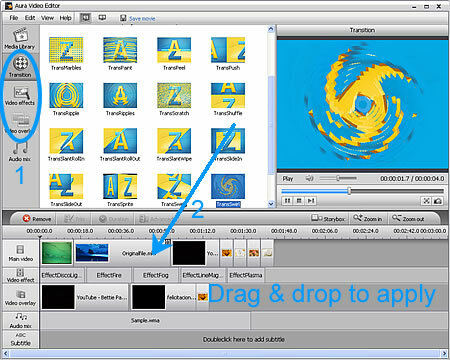 After putting all the files in their places, click Transition button and Video Effects button to apply to your videos and images. You can overlay your videos with other videos. 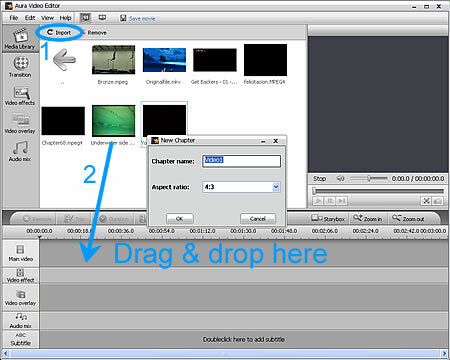 You can trim the video and add watermark then by clicking the Trim button and Add Watermark button. After all editing works, click Save Movie button, and select DVD Disc output type, then click Next button to go to the final step. 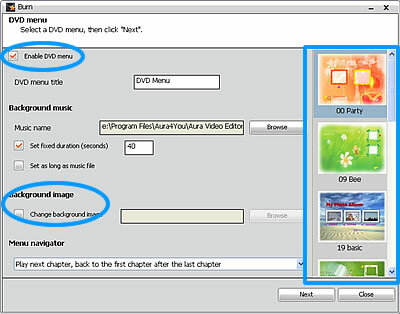 You can select one DVD menu from several DVD menu templates, or select one image from your computer to be as the DVD menu background image. If you don't like to apply any DVD menu, just uncheck the Enable DVD menu option. Want to start converting video to Blu-ray DVD to create a professional home movie Blu-ray DVD? Now download the trial version of Aura Video Editor to experience! Or you can purchase the full version to enjoy your creation of videos for a lifetime at only 24.95 USD! 12 Programs + Free Upgrade + Free Support!